Virgin's Bower (Clematis) - Beautiful climbing shrubs and herbs from northern and temperate regions, and of the highest value for gardens. 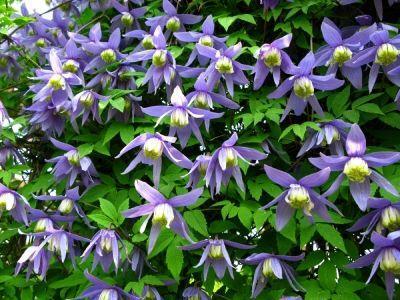 Among hardy climbers there is no other group of plants that equals the Clematis in variety and in beauty. The Clematis vary in habit from herbaceous plants little more than one foot high to woody climbers with stems 50 feet or more in length. Most of the climbing species support themselves by means of the leaf-stalks, which curl round twigs or other slender objects near. The Clematis flower possesses no true petals, but in their place a colored calyx consisting of usually four, but sometimes as many as eight sepals. The Clematises may be used to cover walls, mounds, arbors, pergolas, and fences, and in the open, where no other support is available, rough Oak branches may be used for them, either singly or set together to form a pyramid, while the more vigorous species will run over trees. The most graceful climbing plants of the northern world, for half a century most of them have been lost to our gardens owing to the mistaken mode of increase by grafting these beautiful Chinese and Japanese plants on the common vigorous kind that grows on the chalk-hills of Surrey. Death is inevitable, and few succeed, some struggling to establish themselves in spite of it. I have proved in my own garden for many years that the right and natural way of propagation is by layering, cuttings, or seedlings of good kinds. The French nurserymen use the Viticella for the stock, which is nearly as bad. The right way is to have nothing to do with grafting or potting. Alpine Clematis (Clematis Alpina) - A very pretty plant flowering in spring. The flowers are nodding, the four large sepals being soft blue with a whitish margin, or sometimes almost entirely white. The flower is two inches or more across. Syn. Atragene. Clematis Aphylla - A leafless species forming masses of long, wiry, roundish, rush-like stems of a dark green color, on which in axillary clusters the greenish-yellow, fragrant flowers occur in almost whorl-like formation. At first sight the plant does not greatly attract-that is to say, from the point of size or color of its flowers-yet it is worth having for its exceedingly grateful perfume, which reminds one of the Winter Sweet. The stem-growth extends to several feet in length, not greater in circumference than the common Rush. The flowers are bell-shaped, about 3/4 inch across, and produced on pedicels 1 1/2 inches long. Clematis Armandi - An evergreen species, native of Central and Western China. At first glance this might almost be taken for the New Zealand Clematis indivisa, bearing as it does trifoliate leaves of a dark green, leathery texture. The flowers, borne freely in the axils of the leaves, are each 2 inches in diameter, and composed of six or eight segments, thus forming a starry bloom. Bell-flowered Clematis (Clematis Campaniflora) - A graceful, small bell-shaped flower about 1 inch in diameter, pale violet or almost white. The flowers are very freely borne, and against the deep green, often finely-divided foliage, they are very effective. The plant is not often seen in gardens, though coming freely from seed. Winter-flowering Clematis (Clematis Calycina) - A native of Minorca and Corsica, evergreen with dark brown-angled stems, and during the winter the foliage acquires a fine bronzy hue. The flower is about 2 inches across, yellowish-white, stained inside with oblong, irregular, reddish-purple spots. December to April. In the London district it ought to have the shelter of a wall to flower well. From its near ally, the following species, it differs in its narrower and more divided foliage. Clematis Cirrhosa - (Evergreen C.)-This evergreen species has been much confused with C. calycina. C. cirrhosa, however, if it comes from the Balearic Islands, is not confined to them, but is a native also of various parts of Spain, and is found also in Algiers and on the mountains of N. Africa. The flowers are dull white or cream-colored, downy outside, smooth within, and about 1 1/2 inches in diameter. In S. Europe it climbs over big trees, but it grows only some 8 or 10 feet high in these colder latitudes. Scarlet Clematis (Clematis Coccinea) - A distinct species, some 6 to 10 feet high, the flowers varying in color from rosy carmine to scarlet; they are swollen at the base, but narrow towards the top. A larger-flowered variety is known as major, and various hybrids have been raised by crossing this and other species. N. America. Frilled Clematis (Clematis Crispa) - A distinct and good kind. The color is purple margined with white, or in some forms pale lilac. The flowers are fragrant and appear in June, continuing up to autumn. Some of the forms are bright in color and pretty, but others are amongst the least effective of the shrubby Clematis, the thick, heavy sepals being of a dull purple. N. America. Fragrant Virgins Bower (Clematis Flammula) - A vigorous grower, its leaves are of a rich dark green and remain fresh till well into the winter. The flowers are small (half-inch to three-quarters of an inch across), and appear in late summer and autumn; fragrant, creamy-white, the fruit white and feathery. This species is variable in the size and shape of the leaflets and in the flower panicles, some of which are large with numerous blossoms, whilst in other forms the panicles are few-flowered and scarcely branched. Var. bicolor (Clematis Florida) - The type C. florida is a native of China and has been long known in European gardens. It is allied to C. patens, and, like that species, produces its flowers earlier than the lanuginosa varieties, for the blossoms appear from ripened wood of the previous year, and are usually at their best in June. As a rule, the flowers are whitish with dark stamens in the forms that closely resemble the type, but in the variety bicolor the flowers are doubled, the outer part being white and the inner part purple. As the expanded blossoms are each at least 4 inches across, the beauty of a well-flowered plant may be imagined. The variety bicolor is said to have been introduced from Japan about seventy-five years ago. Indian Virgins Bower (Clematis Grata) - A free, much-branched Indian climber, growing from 12 to 15 feet high, with hairy stems and leaves, flowering freely with me on pergola or over bushes. It is a very good kind, flowering late when few climbers are in bloom. Davids Virgins Bower (Clematis Heracleaefolia) - A dwarf, sturdy plant under 2 feet high, with large leaves and short-stalked corymbs of flowers of a hyacinthine shape and purplish-blue color. Much superior to it as a garden plant is the variety Davidiana, which often ranks as a species. Its stems are about 4 feet long, but are rarely strong enough to stand erect without support. The largest leaflets often measure 6 inches in length by nearly as much in width. The bright lavender-blue flowers are in dense heads, borne on long stalks in early autumn. N. China. Great-flowered Virgins Bower (Clematis Lanuginosa) - A noble Chinese species 5 or 6 feet high, the leaves covered beneath with greyish wool, the flowers the largest of any of the wild kinds, 6 inches across, and the sepals flat and overlapping and of a pale lavender color. It is to this species more than to any other that the beauty of the garden hybrids of Clematis is due. Its flowers range in color from pure white to deep rich purple, and appear from July to October. White Virgins Bower (Clematis Montana) - One of the most beautiful kinds, and when covered with its white flowers during May, one of the most attractive of all hardy climbers. It is quite hardy and vigorous, and may frequently be seen covering walls to a great height; also will run up trees and prove very effective in that way, thriving in ordinary soil and increased by seed or layers. C. lilacina is a hybrid of C. montana and something else. It is very delicate in color, and very hardy. I plant it at the foot of trees, a favourite way of mine of growing Clematises. The Nodding Virgins Bower (Clematis Nutans) - After coming, as I thought, to the end of my enjoyment of these plants, in 1912 I find in the middle of October pretty flowers of the nodding Clematis. We have it in several positions, and it seems to grow well in all. It is a Chinese kind, fragrant, of good growth, and a real addition. Some of the smaller kinds of Clematis are scarcely worth cultivation; but this may well be, it carries the blooming season so much further on in the year. Yellow Indian Virgins Bower (Clematis Orientalis) - A vigorous climber growing 12 to 30 feet high, flowering abundantly in August and September, the four sepals being of a yellow color, tinged with green, and having a sweet but not very strong fragrance. The fruit heads are handsome with the silky tail attached to each seed vessel. Mountains of India and N. Asia. Japanese Virgins Bower (Clematis Paniculata) - A vigorous climber, growing to a height of 30 feet or more. The flowers have a hawthorn-like fragrance, the four sepals being of a rather dull white. It is hardy in Britain, and flowers during September, but with nothing like the profusion that makes it so beautiful a climber in America. Clematis Patens - Next to C. lanuginosa, this is perhaps the most important of the wild types of Clematis. It is a native of Japan (having been found on the Isle of Nippon), and possibly of China also. It was introduced about sixty years ago by Siebold, who obtained it in the gardens near Yokohama, where it had, no doubt, been long in cultivation. The sepals are from six to eight in number, narrow in the form originally introduced, and a delicate mauve color, but the varieties subsequently obtained from it under cultivation have flowers much larger, the colors varying from white to deep violet and blue. Its value as one of the parent species of the garden Clematis is due not only to its beauty, but more especially to its flowering as early as May and June. Clematis Rubens - (The Rosy Virgins Bower) is a recent and very pretty form from China, usually classed as a variety of C. montana, but I think distinct, finer in habit, and less rampant. A friend who grows it in N. Germany tells me it is hardier there than montana. It is excellent for various garlands over walls, light arches, and over low trees and shrubs. It is of easy culture in ordinary soil. The Russian Virgins Bower (Clematis Tangutica) - A noble kind of recent coming, often wrongly described as a variety of C. orientalis. It is a distinct and finer plant. The error has been fostered by botanists, who do not often see the plants alive, and "argue" from the dried plants. It grows freely here in our ordinary soil, deep and moist, but no trellis is large enough for it. The large, deep yellow flowers are followed by handsome seed heads. American Virgins Bower (Clematis Virginiana) - The common Virgins Bower of the United States and Canada. The flowers are borne in flat panicles, the sepals thin and dull white, and although hardy enough, is not in Britain so strong and woody a grower as our native Travellers Joy. Travellers Joy (Clematis Vitalba) - There is no climber native to Britain that gives so near an approach to tropical luxuriance of vegetation as this. The numerous dull white flowers are each three-quarters of an inch or so across, with a faint odour resembling that of Almonds. It is, perhaps, most beautiful when covered with its white fruits, the seeds having long feathery tails. Purple Virgins Bower (Clematis Viticella) - A graceful climber, from 8 to 12 feet high; its flowers in summer 1 1/2 to 2 inches in diameter, the sepals blue, purple, or rosy-purple, and the fruits have only short tails, which are devoid of the plumose covering so often seen in this genus. There are now numerous varieties of the species superior to it in size of flower, and offering also a variety of shades, some very pretty. There are enough varieties of Virgin's Bower that there's bound to be one that would look terrific in your garden. Take a look around and see if you have a spot that would be perfect for one of these beauties, and give it a try.